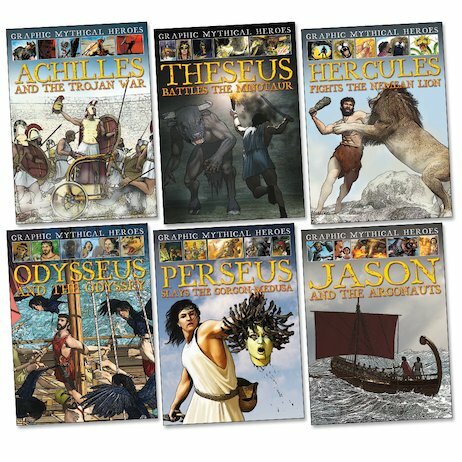 The immortal Greek legends are retold in action-packed pictures where you can feel each mighty thunderbolt and see each staggering sword stroke! Witness the heroes of old rise up to do battle with the mightiest of men – and the deadliest of beasts. Using detailed, action-packed colour pictures which hum with life and energy, these graphic novels draw you deep into the terror and drama of the greatest stories ever told. From the dust and blood of the Trojan battlefields to the dank, chilly nightmare of the Minotaur’s cave, follow in the footsteps of six celebrated heroes as they fight the battles that will become legend. Each book includes a glossary of Greek terms and a full index.